Size: 16oz Dia 4.25" x H3"
Intricate yet sturdy. This stoneware canister is a perfect addition to food-safe storage. 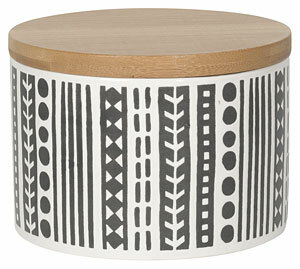 Finely detailed patterns delight the touch, and the snug bamboo lid provides old-world charm. Canister is dishwasher safe. Hand wash lid only.